Sample authority letter for degree attestation from HEC (Higher Education Commission) offices in Pakistan available for foreigners, other cities and due to sickness. This authorization letter is required when someone else is going for your degrees attestation on your behalf. If your blood relation is going than this authorization letter can be printed on simple paper and duly attested by 18th grade govt officer. But if your blood relation is not going than you have to print this letter of a stamp paper duly attested by 18th grade govt officer. 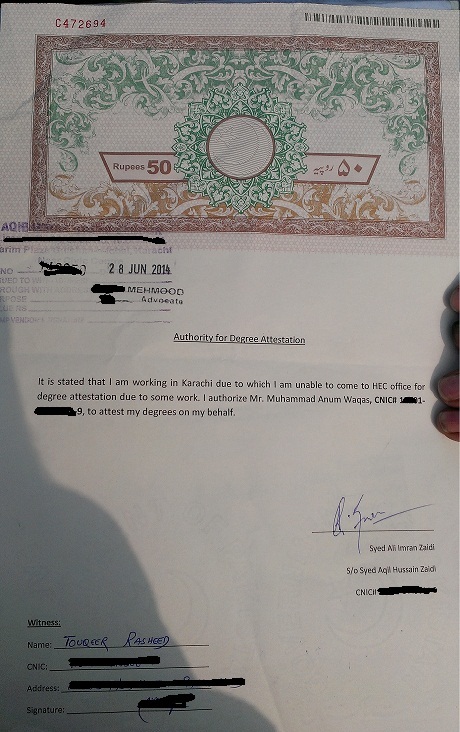 It is Stated that I am working in Karachi due to which I am unable to come to HEC office for my degree attestation due to some work. I authorize Ms. Samina Waqas, CNIC 12345-1234567-8, to attest my degrees on my behalf. Please consider my request I will be thankful to you. I am Muhammad Samiullah S/O Abdul Haq CNIC# 12345-234567-8 can’t appear personally for my degrees attestation because I am in London UK. This is to authorize Ms. Saima Jillani CNIC# 12345-1234567-8 for my MSc and BSc degrees attestation from Higher Education Commission (HEC) on my behalf. All of my required educational documents and a copy of CNIC is enclosed with this letter. I request you to please consider my request for the attestation on my behalf.